In the world of online language learning, there are basically two heavyweights: Duolingo and Babbel. Duolingo is betting on a freemium model and a strong focus on using algorithms to help you learn better, while Berlin-based Babbel is a paid service that employs hundreds of teachers. As Babbel co-founder and CEO Markus Witte announced at TechCrunch Disrupt Berlin today, his company is now moving into a new area of language learning with the launch of a language travel marketplace. The company also today announced that it sold over 1 million subscription in the United States in the last year. This new service, which is scheduled to go live next year, is the result of the previously undisclosed acquisition of a Lingo Ventura, a Berlin-based startup that partners with international language schools and local providers to offer a language travel booking platform. As Witte told me ahead of today’s announcement, Lingo Ventura already had connections with 200 language schools in 30 countries. The company never quite managed to make a dent in this market, which has traditionally been quite fragmented. Witte believes that Babbel, thanks to its existing user base, will be able to turn this into a profitable business, though. “There is a lot of potential here because the current market is not very transparent,” Witte told me. “In Europe, our brand is so well-known now that we are the first stop for learning languages.” And that brand awareness will surely help drive interest in this new platform. The person who uses the company’s app has, after all, already shown interest in learning languages and a willingness to pay for that. While language travel is quite popular in Europe, it remains a bit of a foreign concept in the United States and few people specifically travel abroad to learn a language. This isn’t a small market, though. In Germany alone, market revenue was about €220 million in 2017, and the various companies that play in this space booked about 150,000 travel bookings last year. Unsurprisingly, Babbel will first focus its marketing efforts for its yet-to-be-named travel marketplace (I think Babbel Travel is a safe bet) on Europe. The platform, however, is global, and Babbel isn’t going to stop anybody from booking through its platform, of course. 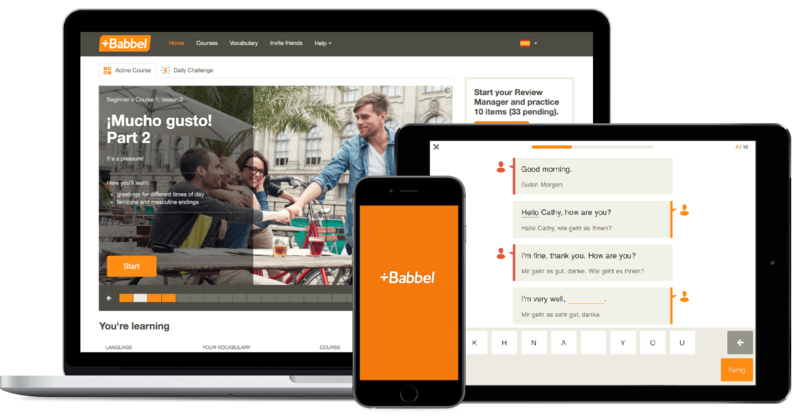 As far as the U.S. language travel market is concerned, though, Babbel expects that it’ll be able to pull in some customers there, too. “It’s not zero,” the company’s U.S. CEO Julie Hansen told me when I asked her about that market. “I think in due course, we’ll discover if there’s a place for us. In a way, you can serve a market better that is so fragmented and ill-defined.” North America in general has generated quite a bit of growth for Babbel recently, especially since it appointed Hansen as a CEO there, though it remains to be seen if travel will become a major revenue source for the company there.